Come see us in Winston Salem -- and receive a free Gelato! Sounds Yummy, right? 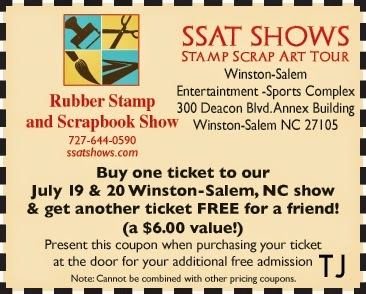 If you are in the Winston-Salem area, I invite you to the Stamp Scrap Art Tour Show this weekend. Print out the ticket here, and you and a friend can both go for the price of one! In addition, I will be demoing Gelatos all weekend, and the first 50 people who stop by and mention this post will receive a free Gelato! Not bad, right? Come see some of the techniques used in the Artistic Effects CD in action, get a free Gelato, and join in the fun. See you at the show! Just as an aside -- I m adding Gelatos to my website, along with several other products, today! You can now buy some of your favorite tools and coloring mediums from Technique Junkies.